Next Thursday is Thanksgiving Day and we will NOT have a Net next week. So, I thought I’d do a little bit of Thanksgiving Trivia this week. Since 1941 Thanksgiving Day has been fixed as the fourth Thursday in November. That means it can occur on a variety of different dates. For example, last year Thanksgiving Day was on November 22nd. This year it is on November 28th. Next year it will be on November 27th. Since it is fixed as being on the fourth Thursday in November, on how many different dates can Thanksgiving Day occur? This entry was posted in Trivia and tagged date, day, Thanksgiving, turkey on 11/21/2013 by N6CIZ. 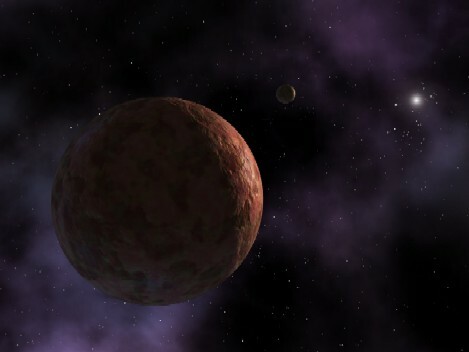 Today in history… On November 14, 2003, the most distant object ever found in our solar system, a dwarf planet named Sedna, was discovered by astronomers at the Mount Palomar Observatory. Sedna has an unusually elliptical orbit around the sun and is twice as far from the sun as any known object in the solar system. It is about half the size of our moon and is the largest object found in the solar system since Pluto’s discovery in 1930. Objects in our solar system orbit around the sun. It takes Earth one year to orbit the sun. How many years does it take Sedna, the most distant object in our solar system, to orbit the sun? This entry was posted in Trivia and tagged astronomy, orbit, planet, planets, Sedna on 11/14/2013 by N6CIZ.